Little Magic Man (Schmoo!) came into my life as a very cheeky 6 yr old! He was bred in Ohio in March 2000, son of NRHA 11 Million Dollar sire Topsail Whiz. Magic was very small compared to my previous horses, but for a little pocket rocket he definitely had a personality and sense of humour that was larger than life! He was a fantastic horse and extremely different to anything I had ridden before, very athletic, sharp and highly responsive! Our career started off slowly and we had a fair few hurdles along the way, its safe to say there was never a dull moment with Schmoo as you never knew quite what you were going to get! Towards the end of my Youth career we started to get it together, and he became very versatile. At my final Euros as youth rider I felt that Magic needed another event as we had 10 days and only 2 Reining runs, So out came the English Tack!! Having never done it in his life and with a 20 minute warm up he went straight out and won the go arounds and we ended up European Champion much to my amazement!! 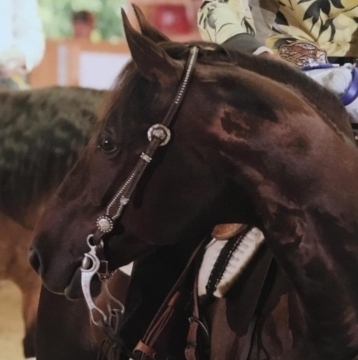 After that he became a very consistent and reliable competitor always running between the 70-71 mark in the reining as he would glide through his patterns with ease. Magic took me through my first Senior British Team Event in Mooslargue France and took me through many International competitions. We stared to become very strong contenders in the Non Pro division and his earnings and trophy collection really began to grow. He dominated the Int Non Pro for the Majority of his career scoring between 72-74 at every competition becoming a European at his final show. Magic now enjoys his retirement in a field with his best buddy and still likes to show off his skills by performing large sliding stops and dinner time, just because he can!